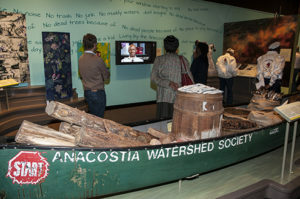 The Smithsonian’s Anacostia Community Museum explores issues impacting urban contemporary communities. Its approach starts with research and documentation of urban life and history organized around the concerns that are relevant to the largely African American residents in the local river neighborhoods east of the Anacostia River, where the museum is located; then expands to metropolitan Washington, DC area and to like urban communities. Identified issues are explored through exhibitions, publications, and public and educational outreach programs. Through its innovative research focus, exhibitions, and education programs on the issue of urban waterways, the museum has actively encouraged community investment and stewardship. engage interested stakeholders in activities which will aid in the restoration, reclamation and investment in equitable development. Network development: the museum publishes a newsletter called Urban Waterways, which documents the successes of collaborators, and hosts ongoing community forums where people convene to discuss a range of topics ranging from waterfront development to healthy eating to green jobs. Engagement and education through educational exhibits, citizen science, and youth programs. The Citizen Science Program/ Urban Ecology Engagement Initiative (UEEI) began as an outreach component of the Reclaiming the Edge exhibit and now serves as a unique citizen science program generating data for the Department of Environmental Quality. Students from the Anacostia neighborhood—primarily from low income, African American households—learn how to document changes in river levels, study macroinvertebrates, monitor water quality, and analyze erosion patterns in the watershed and tributaries. These hands-on learning experiences include field trips to tributary points in various locations in Washington DC and Maryland plus class time in the laboratory at the museum’s research partner, the Smithsonian’s Environmental Research Center (SERC) in Annapolis. This year-round program serves approximately 30-45 middle and high school students annually. Another key element has been to facilitate professional development for teachers, integrating Science/Technology/Engineering/Math (STEM) education into the program, to help students meet Next Generation Science Standards (NGSS) standards and inspire them to pursue STEM careers. In the future, the program will incorporate art and language, transforming into a STEAM-oriented program and reaching a wider array of teachers and schools. Supported by an Environmental Protection Agency (EPA) Urban Waters Grant, other funders have seen the value of this unique project. The Smithsonian Office of Education Youth Access Grant of $148,000, and gifts and material support from State Farm totaling $83,000, has allowed the program to purchase additional equipment and supplies and reach more students and teachers in DCPS and Prince George’s County Schools. Restoring waterways improves the health of communities and creates a renewed sense of pride through engagement and stewardship. Since development and community beautification can push out residents, it is also essential to make sure they have a voice at the table. To this end, the museum continues to provide a space for community residents to convene, as well as after-school and summer educational programs for youth. Museum staff are currently doing further research in collaborating cities around the world; updating information on the progress of restoration efforts in the Anacostia River; and reaching out to environmental justice communities along the Gulf Coast, including Vietnamese fishing communities in Biloxi, MS, and Bayou La Batre, AL (Bounds 2011, Elliot 2015); and historic African American communities in Moss Point, MS, Africatown, AL, and Turkey Creek, MS. These are communities that are still experiencing the long-term effects of hurricanes (particularly Katrina and Rita, August 2005) and the British Petroleum oil spill (April 20, 2010), and which are also at the forefront of large-scale environmental issues such as climate change and coastal land loss. The museum is interested in documenting these communities’ efforts to strengthen and protect their communities by fighting for and implementing physical improvements, such as greenways and blueways, in order to gain a voice at the table and make their communities more resilient.